A two-alarm fire in a Hamilton Heights apartment building injured five firefighters. 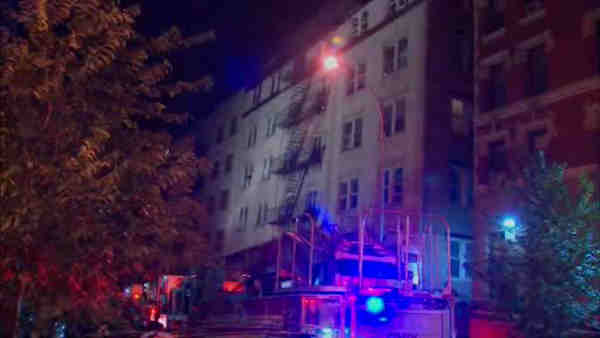 HAMILTON HEIGHTS, New York (WABC) -- A two-alarm fire in a Hamilton Heights apartment building injured five firefighters. The fire broke out on the top floor of the building on West 141st Street just after 1:15 a.m. Thursday. The city buildings department issued a full vacate order on the fire building. Five families, 14 adults and 7 children, were left homeless and were taken to a nearby hotel by the American Red Cross. Five firefighters were treated for minor injuries battling the blaze. Most were taken to St Luke's Hospital, although one went to New York Presbyterian Hospital-Cornell. West 141st Street was closed between Riverside Drive and Broadway.